My name is Mardi Richmond and I am a Certified Professional Dog Trainer and a Certified Behavior Counselor. 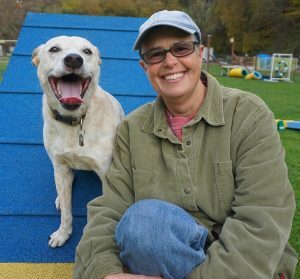 I have been a student of dog behavior and training for almost 30 years, and have been helping others to train their dogs for about 20 years. I am committed to helping people create solid, happy, long-term partnerships with their dogs. I believe we can train with respect and consideration for you, your dog and your relationship. My training follows science-based positive reinforcement methods with a focus on cooperation, trust, and communication. I offer classes for puppies and adults, private training and behavior consulting, and I also write for national dog-related publications such as the Whole Dog Journal and Bark Magazine. I volunteer for a variety of rescue and shelter organizations, primarily working with dogs in foster care that need a little extra help to make them adoptable. I also offer an apprenticeship program for those learning to become professional dog trainers. To learn more about my apprenticeship program, click here. Helping you bring out the best in your dog with kind, gentle, and effective training methods. Contact me today if you are looking to train your dog in a fun, supportive environment! "We adopted our sweet little Elwood from the SPCA exactly two years ago tomorrow. As first time dog owners (first time as adults) with two young children, we were ill-equipped to handle a dog who turned out to be highly reactive, anxious, and fearful, particularly with other dogs. Without Mardi's support, patience, skills, and experience, I'm not sure that we would have been able to keep him. Not only did she help train Elwood, but she trained our whole family. Along with teaching us essential techniques, Mardi Richmond helped us all become more confident and comfortable in handling Elwood. This allowed him to feel more secure with our family and in our home. Mardi's positive training methods and gentle, direct, and flexible style are perfect for our family. While we will always have work to do, Elwood has made so much more progress than we ever thought possible! Through our work with Mardi, Elwood has become a happy, playful and sweet member of our family. And, Chance is a wonderful training partner!"